You carry your mobile phone or iPhone because you basically want to access and store information wherever, whenever. Your contacts, to-dos, and calendar of events are all stored in your built-in applications. But these are only the basic applications. Not all mobile devices have applications that make you organize your shopping and banking. But with LifeTopix application, you could get access to all your information in just one sweep. What’s LifeTopix iPod Touch App about? LifeTopix is your all-in-one answer to every organization need that you require. On the primary screen you could already have a clear picture of every kind of application that you need to access. Of course, the main menu button is easy to see, making you go back to where you started so you won’t get lost, especially if you are a first-time user. LifeTopix app for ipad and ipod touch has a very huge database. You could access almost any time of information that you need. You could ever enter the date of your doctor or dentist. There’s even an e-mail backup to your data and a restore feature to LifeTopix. For security purposes, you could even have a PIN or passcode. Compared to other ipod touch applications, this LifeTopix app doesn’t have that much attractiveness when it comes to the user-interface. It just focuses on information storage and access. Even so, this application accomplishes everything. LifeTopix iphone app does not stop at storing your data. It finds associated information with the data you that you enter. So, your knowledge just keeps on growing. LifeTopix is cool application which can really be a very handy tool when you travel or when you have to keep a series of appointments. LightArrow Inc. developed this application. They really thought of moving organization techniques to the next level. 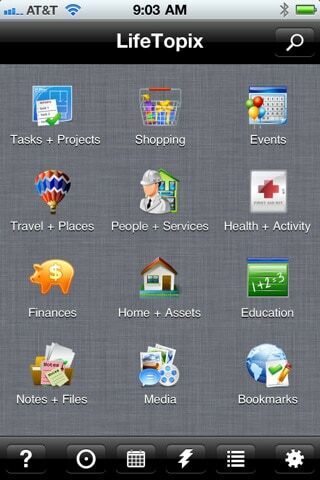 With LifeTopix ipod touch app, you are able to get access to everything in just one application. LifeTopix app for ipod touch, iphone and ipad is not very complicated to see the need for a myriad of tasks to do in one device. That is why more and more companies are developing ipod touch applications like LifeTopix to give you the maximum function of your device without purchasing other devices that you have to carry along with you. This LifeTopix ipod touch app is a very innovative tool that is an excellent example of efficient multi-tasking. So, if you are not into installing 16 other individual applications to cater to each organization need, you just have to get LifeTopix for your iPhone. With the restore, passcode, and backup features of this application, you are more than a hundred percent sure that your data will be safe at all times. Grab this Lifetopix iPod Touch App in iTunes apps store here. How to get the iPhone 5 Before Someone Else?